One of the defining characteristics of inland fisheries is that they are closely impacted by other essential human activities that rely on the same fresh or brackish water ecosystems, such as hydroelectricity generation and irrigated agriculture. 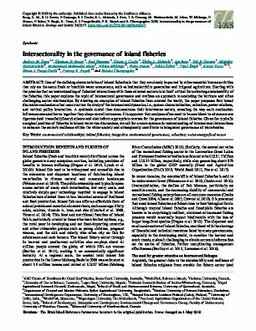 Starting with the premise that an understanding of fisheries' interactions with these external sectors is in itself critical for achieving sustainability of the fisheries, this paper explores the topic of intersectoral governance and outlines an approach to analyzing the intricate and often challenging sector relationships. By drawing on examples of inland fisheries from around the world, the paper proposes four broad discursive mechanisms that can structure the study of the intersectoral dynamics, i.e., system characterization, valuation, power relations, and vertical policy interaction. A synthesis model then demonstrates their interwoven nature, revealing the way each mechanism influences one another as together they shape overall outcomes. It is apparent that analyses often need to be combined to advance more rigorous (and transdisciplinary) science and also inform appropriate courses for the governance of inland fisheries. Given the typically marginal position of fisheries in inland water-use discussions, we call for a more systematic understanding of intersectoral interactions to enhance the sector's resilience within the wider society and subsequently contribute to integrated governance of waterbodies.